The primary role of vitamin D is to promote calcium absorption in the gut and maintain adequate serum calcium and phosphate concentrations that enable normal bone mineralization. It is needed for bone growth, remodeling, and maintenance. 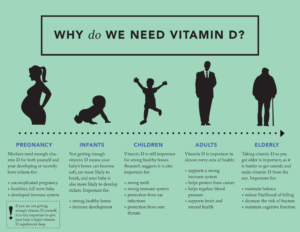 But Vitamin D has also been shown to have roles in the modulation of cell growth, neuromuscular function, immune function, and reduction of inflammation. It is further being studied for preventive benefits for cancer, cardio vascular disease, and depression! How can I get Vitamin D naturally? The primary way your body gets adequate levels of vitamin D is from ultraviolet rays. When the skin is exposed to UVB wavelengths of light the body naturally synthesizes and stores vitamin D. Vitamin D is synthesized in an inactive from and through hydroxylation in the liver and kidneys vitamin D is converted into is active form. The best time to get sun exposure is between 10am and 2pm during the summer months. The amount of sun exposure needed depends on skin color and the amount of skin that is exposed. Individuals with darker skin need more sun exposure than those with lighter skin. Because the amount of UVB your body absorbs depends on so many variable the Vitamin D Council recommends to get half the sun exposure it takes to get pink. During the winter months the angle of the sun is such that the UVB wavelengths of light are mostly reflected from the atmosphere and do not reach people living in the northern 2/3 of the country. These are the individuals most at risk of being inadequately supplied with Vitamin D.
There are some foods that are a source of Vitamin D but unfortunately most of these foods do not contain a high enough amount to meet our requirements. Some of the foods that contain Vitamin D are Tuna, sardines, fortified milk, beef liver, egg yolks, and cheese. How do I know if I am deficient in Vitamin D? 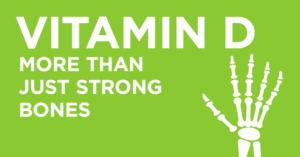 Your vitamin D levels can be tested with a blood draw to determine the serum levels of 25-Hydroxyvitman D. There are ongoing discussions about the appropriate levels of vitamin D to be considered adequate for optimal health. Currently a person is considered inadequate if they are below 20 ng/mL of serum. Individuals between 20-50 ng/mL are to be at adequate levels. Some evidence shows that levels over 60 ng/mL increase the risk of kidney stones and tissue damage. How much Vitamin D should I be getting? If you are deficient in vitamin D (confirmed by your physician) your Doctor will recommend the correct amount to take and the duration of time you need to take the prescribed dose. For the average individual, the Institute of Medicine recommends the following. 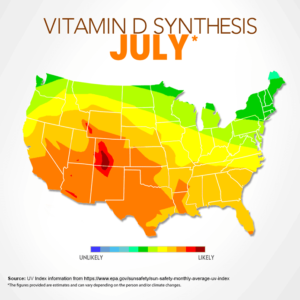 Recently Vitamin D has gained much in recognition in the media and health community. As with most heath related topics there are many opinions, facts, and suggestions on the matter. This generally leads to a lot of confusion both within and outside of the health care community. 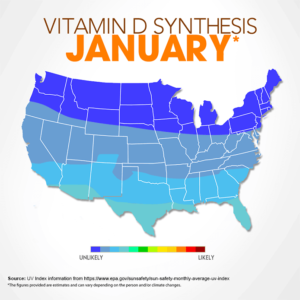 Currently there are many studies being done on the positive and negative effects of Vitamin D. Most of these studies are finding various benefits to increasing ones intake of Vitamin D but unfortunately many of these studies are not conclusive in there results and have mixed outcomes when compared to similar studies. We do know that Vitamin D is a critical fat soluble vitamin that is necessary for the regulation and absorption of calcium and that there is a growing body of evidence for Vitamin D’s role in many other processes within the body.